Bodrum Underwater Archaeology Museum is situated in St. Peter's Castle which was built around at 15th C by the Knights of St. John of Rhodes. The castle houses interesting artifacts from Prehistoric, Carian, Hellenistic, Roman, Byzantine, Medieval and Turkish periods. 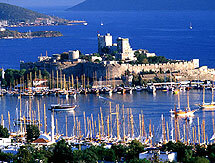 The Bodrum Museum of Underwater Archaeology houses a collection of artifacts from the wrecks of a number of ships. One ship lost off Cape Gelidonya near Finike c 1200 C BC, was a Syrian trader bringing a cargo of Ingots from Cyprus. Another lost near Uluburun, Kas in the 13-14 C BC was carrying a cargo of gold medallions, ostrich eggs, a gold cup, copper and tin ingots. The artifacts were recovered by Turkish and American archaeologists .